What can you do after walking across the Brooklyn Bridge? You can explore the two nearby neighborhoods, DUMBO and Brooklyn Heights, go for a walking tour of Vinegar Hill, and in summer, hop the ferry back to Manhattan or Long Island City . 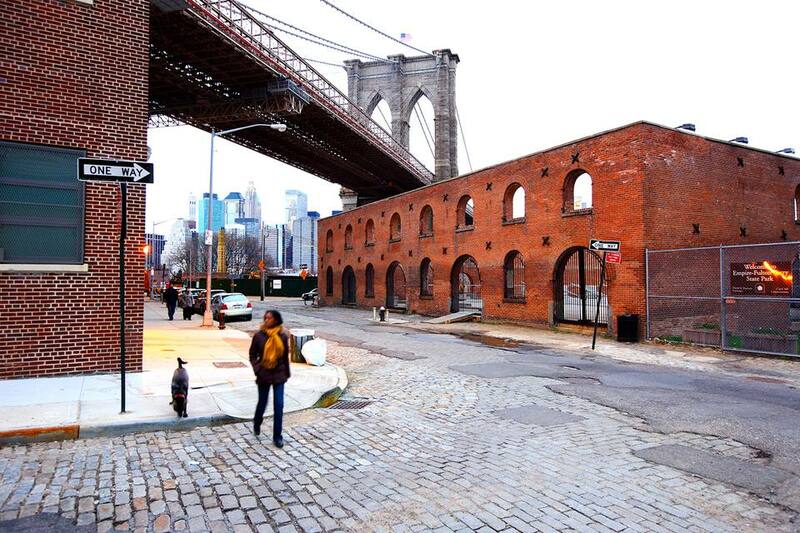 Having arrived in Brooklyn, you will be less than a ten-minute walk to the neighborhood known as DUMBO. 1. Eat! The most famous food destinations here are Brooklyn Ice Cream, pizza at Grimaldi's and chocolate at Jacques Torres. However, there are great restaurants throughout DUMBO, and a few inexpensive, fun dive bars. 2. Relax in a waterside park. Brooklyn Bridge Park is a gorgeous new park, overlooking Manhattan. 3. Take a cultural trip. See galleries, attend edgy theater, catch classical music at New York's floating concert hall, on an old barge. See listings for St. Ann's Warehouse; Bargemusic. 4. Explore! Check out DUMBO. It's a quirky, arty , historic Brooklyn neighborhood between the Manhattan and Brooklyn Bridges, near historic Fulton Street. Once an industrial area, it's now one of Brooklyn's trendiest locations, with multi-million dollar high rise apartments overlooking Manhattan and the East River, interesting restaurants, and shops. The name is an acronym, which stands for "Down Under the Manhattan Bridge Overpass." But don't worry, it's also under the Brooklyn Bridge. Two bridges for the price of one!